In a "standard Fermi solution", one multiplies guesses of several factors to reach an estimate. This Demonstration uses an expanded version of the method, originally developed for microbial risk assessment, in which the ranges of the factors are entered instead of their values. Guesses are then generated repeatedly using random factor values within the entered ranges and the resulting estimates are plotted as a histogram on which their distribution's curve, which is approximately lognormal, is superimposed. The mode of this distribution is considered the "best estimate". It is also calculated analytically and both values are displayed on the plot. Snapshot 4: an expanded Fermi solution based on 2000 repeatable random estimates (seed=10) for between 30 and 50. This Demonstration generates estimates of the number of affected individuals or units within the range minimum to maximum set by the user with sliders and a popup menu. The ranges of the probability factors ( from 1 to 6) are specified by minimum and maximum and are set by sliders. The number of repeated trials is entered using the top‐most slider. The program generates a new dataset when the value of any control other than the clear button is altered. For a new random dataset at the current control settings click "clear" followed by "generate". For scenarios involving fewer than all six factors, set the unused factor's minimum and maximum values to 1. 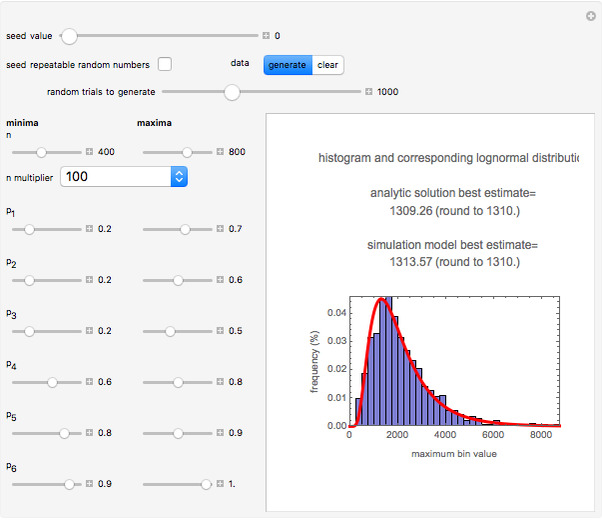 The panel shows the program controls at their current settings, a histogram of the estimates computed in the repeated trials, and the lognormal distribution having the same logarithmic mean and standard deviation as the generated estimates depicted as a solid red curve. The plot title text includes the analytic solution "best estimate" and the one derived from the lognormal distribution's mode. Estimates for and outside their sliders' allowed range of 1 to 1000 can be obtained by setting the " multiplier" popup menu to the appropriate factor. Notice that if all seven factors' (i.e., and the six 's) minimum and maximum values are the same, the program will render the conventional Fermi solution plotted as a spike. Also, if all but one of the seven factors' minimum and maximum values are the same, then the program will generate random estimates with a uniform distribution. In that case, although the program will still generate a corresponding lognormal distribution curve, it may no longer be representative. Mark D. Normand, Micha Peleg and Joseph Horowitz "Expanded Fermi Solution for Risk Assessment"